2. Jo Malone Christmas Cracker – What an adorable gift! I love love love love Jo Malone perfumes. Their scents, packaging and design is just beautiful. In this little Christmas cracker set, you get a body wash, hand cream and the Blackberry & Bay perfume. (p.s. I’m addicted to the Blackberry & Bay scent. It’s my current favorite. ) This is a great gift for any lady in your life. 3. “Wildflower” by Drew Barrymore – First of all, how cute is the cover of this book!? I’ve heard raving reviews about this read and can’t wait to dive into it myself. The book is written by Drew Barrymore and goes over her life all the way from when she was in E.T. 4. Anthropologie mugs – Aren’t Anthro mugs just the best?! They always have the prettiest mugs and they make the best gifts for any girl in your life. During Christmas, they come out with their limited edition Golden Monogram Mugs, which usually fly off the shelves. Get them before they sell out! 5. Jewelry trays – Jewelry trays are always a great gift because they act as a storage for your precious trinkets but also look great as decor on a bedroom dresser or in a bathroom. This one from Kate Spade is just adorable. I also love this one , this one , this one and this one . 6. Sonix phone cases – I love Sonix iphone cases. They have such fun patterns and a wide variety of beautiful cases to choose from. These make such a great gifts! I mean…how cute is this holly one for the holiday season? 7. Rifle Paper Co journals/notebooks – Rifle Paper Co makes the most gorgeous notebooks & journals. People always need paper to keep notes, so why not have a cute notebook to keep them in? I love using these journals when I travel to keep track of the places we eat, drink and visit. 8. Candles – Candles are my GO-TO gift for those friends that are too hard to shop for. Who doesn’t love candles? You can walk into any Anthropologie store, pick out a cute candle & a mug and just like that you have a cute little gift. I love that Anthropologie is always changing their collection of candles but always keeps their classic candles in full stock. 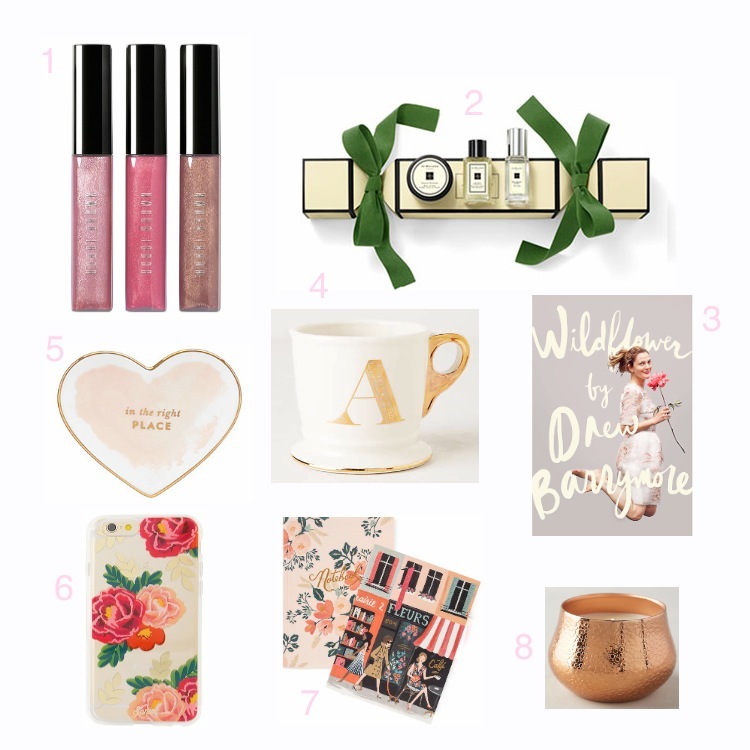 Hopefully this post inspires some easy and fun gift giving for the ladies in your life! I have a really similar phone cover (from the Rifle Paper Company). I absolutely love it.